"Before I was president, I just want to point out, you, the Blackhawks, had gone almost half a century without seeing this thing," Obama joked. 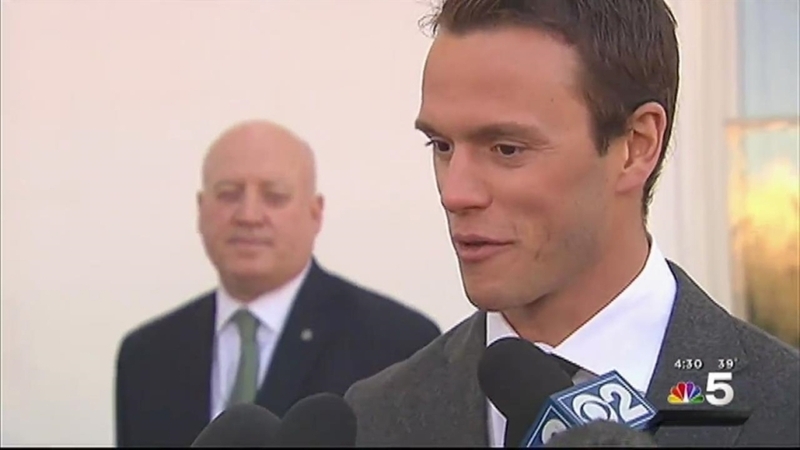 "Now you've got the Hat Trick, so I think it's pretty clear, the kind of luck I brought to this team." For the third and final time during his administration, President Barack Obama welcomed the Chicago Blackhawks to the White House Thursday to celebrate the team’s 2015 Stanley Cup championship, but this time the president received something special from the team in return. "And by the way, we have a state dinner coming up with Canada," he said, "and we might just leave [the Stanley Cup] right in the middle of the room." Joined by Hawks owner Rocky Wirtz, president John McDonough, coach Joel Quenneville and many of the players, the president congratulated the team in the East Room of the historic residence. 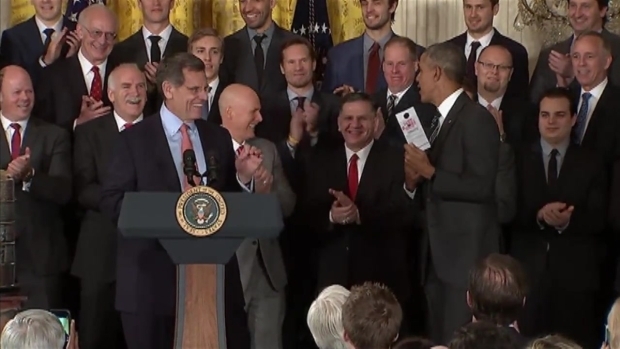 President Barack Obama Thursday honored the Chicago Blackhawks at the White House for their 2015 Stanley Cup win. The team gave President Obama a parking pass to the United Center, a present the president called "the best gift" he's ever received at the White House. There, Wirtz presented the president with a jersey representing the team's three championships, a painting, and a replica of Lord Stanley. The team owner then gave Obama a more unexpected gift. "We want also want you know as you might be spending, as you said, a little more time away from the White House in years to come, and so while you're driving yourself around Chicago, we thought that we might want to present you with something that is near and dear to our heart, and that's a parking pass for the United Center," he said. "It's not only good for Blackhawk games, but for any event at the United Center for you and your family." Obama passed along some encouragement, telling the team to "squeeze one more [win] in there before I leave." He paid tribute to the coaching, front office staff and Coach Q's facial hair: "It appears the secret of any coach hoping to win a title in the city of Chicago is to grow out your mustache." Also featured was the scouting talent who, Obama joked, offered to help him pick his next Supreme Court Justice. The Blackhawks, who already visited Washington, D.C. earlier this season to play the Capitals, made a stop in the nation’s capital between games on a two-game road trip. They’ll be taking on the New York Rangers at Madison Square Garden on the day before their visit, and they’ll then head to Minnesota for their Stadium Series tilt against the Wild on the Sunday following the White House ceremony. The Blackhawks have won three championships during Obama’s administration, also hoisting the Stanley Cup in 2010 and 2013. Obama said he's got his eye on his other Chicago teams to win it big in the near future. He even gave a shout-out to his North Side rivals, the Cubs. "I haven't given up hope on the Bulls or the White Sox or the Bears," Obama said. "Heck I'd even take the Cubs. But in the meantime, let's give it up for the Chicago Blackhawks."